Now for something completely different! 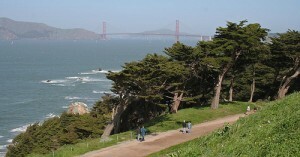 At AASCEND‘s April 16 meeting we’re all going to go for a hike (more like a walk) at San Francisco’s beautiful and easy-walkin’ Lands End. Come revel together in the calming natural world so many autistic people enjoy. But first, are you autistic, creative, and want to earn $ with your abilities? Be sure to take this short online survey >here< to help the Autism Creatives Collective get underway. The survey deadline is now extended to April 21, so hustle at it! The hike will be a chance to all get to know each other better and to enjoy El Niño’s spring bounty in one of the more gorgeous places on this big round Earth – and it’s right here in San Francisco! There is food at the Lookout Cafe and Visitor Center where we’ll meet, but you might want to bring a snack. Stay tuned for further details and updates. Autistic adventure will head the day at AASCEND‘s March 19 meeting, starting off with a report from seasoned expeditioneer and AASCEND member Paul Nussbaum telling the tale of his recent week in the icy wilderness of Yellowstone National Park. This outing was undertaken as practice for Paul’s planned Expedition-Autism: Greenland 2017, a month-long trek across the Greenland Ice Cap to showcase autistic ability. After Paul’s report the adventure turns inward, with a screening of the new short film, SPECTRUM: A story of the mind. This film highlights autistic sensory issues and features appearances by Tito Mukhopadhyay, artist Judy Endow, and Aikido master Nick Walker. The segment on Judy is an excellent sequel to last month’s AASCEND meeting on the newly-forming Autistic Creatives Collective because Judy is an established commercial artist. Nick Walker is familiar to AASCEND from his presentation about managing autistic stress at an AASCEND meeting five years ago. Come share your own adventures, outer and inner! We hope in particular to hear experiences about coping with autism-related sensory challenges.